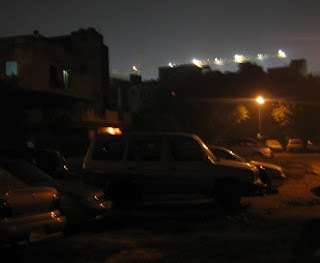 The Saket metro station is being constructed near the traffic intersection just beyond the block of flats I live in and a highlight of our evenings these days is the sight of a giant crane hovering over the tops of nearby houses. Most of the time it’s horizontal, as in the picture below, but once in a while it swings around and comes to rest in a nearly upright position, and then it looks like it’s giving the finger to the colony. The photo doesn’t really capture the effect but it's a grand view, especially after dark. Here we are in our enclosed neighborhood park, walking the pup, and it’s quiet like a village green – except that there’s a huge mechanical pulley moving back and forth in a portion of the sky, illuminated by the metro site dozens of feet below it. It makes me feel like a character in a 1950s alien-invasion novel set in a quiet British town where nothing much is expected to happen. The construction has been going on for ever with no end in sight and our detoured roads are looping crazily all over the place, so the wife and I have been mulling ways for the DMRC to employ the crane to other purposes. I mean, if you have a monster crane in the sky, shouldn’t you make imaginative use of it? Abhilasha proposes turning it into a tourist attraction for a few hours each day: it can be called the Saket Eye and members of the paying public can take turns riding in the thing. Since most of us south Delhiites don’t have access to a bird’s-eye view of the city, this would be a welcome move. Another option is to use the crane as a pick-up facility to help clear traffic jams. Get buses air-lifted at the intersection and safely set them down a minute or so later at the Malviya Nagar-Panchshila crossing. (These days it takes more than 20 minutes to travel that distance in the conventional way.) In fact, if a few more cranes of similar size are added to the existing one and placed at strategic locations, we could have a regular midair shuttle service at our disposal. As winter sets in other possibilities will arise, such as using the crane as a well-lit landing aid that can point descending aircraft in the right direction on foggy nights. As responsible citizens one must keep looking for ways to extract side-benefits from interminable projects. are u sure u going to employ the crane for all those purposes? can understand how painful it is to move thru the various diversions in traffic created by metro construction, but please let them work on their core competency or better remove those cranes if not needed. they can be dangerous. i saw them once scraping an entire wall when the crane accidentally moved towards the residential area in kingsway camp. I visited saket after more than two years, in August this year. I could not recognise the roads clearly . I completely forgot the right turn you take if you are coming from Geetanjali enclave to the PVR. There is so much construction work going on that driving is painful during chaotic traffic hours. On top of that the select citywalk mall has made matters worse.I was not able to believe that the place can look so different from the one i was used to. Normality was restored when I found the same parkingwallah at PVR directing the cars with frantic gestures and exclamations of 'Aage or aage, zara side mein! I believe with the metro coming in the constraint for space would make matters worse, where is the space for constructing a parking lot near the metro station? Right across the golf view apartments the road is congested and the only space up for grabs was a grinning potrait of 'Vijay jolly' about two years back. Rahi: oh, I'm sure it's needed for constructing the station. Btw, I hope you didn't take the post seriously? I assure you I'm not a consultant for the DMRC! Shwet: even those of us who actually live here still haven't grown accustomed to that particular detour. I remember the first time I drove out of the colony gate and encountered it (it was opened overnight - we had no clue it was happening) I was astonished that it was even possible to create a whole new road in an area that I had assumed was already occupied by shops/residential buildings. I only go to saket when planning to see a movie at PVR or eating at the famed dhabas with the BF. Had one such view of the construction site this week. Man! I would get lost in what they have done to the roads. (thank-god the BF has better sense of direction than me!) One minute its a straight road and the other it takes a sudden turn with those amazingly weird speed-breakers. As in, why three of those together, and then another one alone on the same stretch? 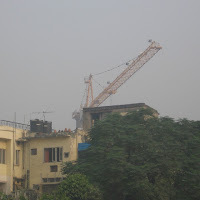 Btw, I think those are the same cranes like the one which fell on the metro bridge being constructed in East Delhi. I cannot imagine how the ppl would be sleeping at night with such a huge crane over their heads. I hope the people at DMRC are employing all safety measures here. Weird! Weird! Weird! After watching The Transformers, whenever I see cranes working at night, I am reminded of the scene where the giant protagonist robot is rummaging through a scrap yard at night. Your giant crane would be even more like it! Well, this is totally brilliant. The lifting buses idea is so good!! Plus there's something so 1950s about the vision of an earnest couple (such as theeselves) quietly walking their dog through their suburban neighbourhood while a glowing mechanical monster hovers overhead... etc. Ha ha ho ho.